A recent defense interaction highlighted some of the ongoing activity within that aspect of bilateral ties. This week, Brunei’s new air force chief paid his first visit to Singapore in his current capacity. The visit placed the focus on the defense side of the relationship between the two Southeast Asian states amid wider domestic and regional change. As I have noted previously in these pages, Singapore and Brunei have a close defense relationship as part of their broader bilateral relationship. This is reflected not just in traditional aspects like exchanges, visits, and exercises, but also the fact that Brunei has benefited from the expertise of the Singapore Armed Forces. 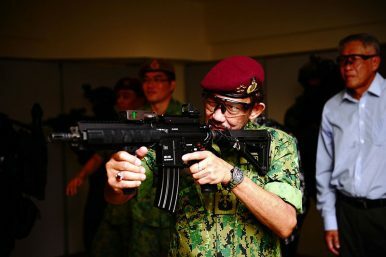 Singapore’s military also holds training in Brunei as it does with a number of its other key partners. The defense relationship has continued over the past year as well, through both exercises and regular meetings. One aspect of this has been high-level visits, with particular attention on them as a range of new Brunei defense officials pay introductory visits to the city-state after assuming their positions following some personnel changes in 2018 tied to wider domestic developments. This week, the defense aspect of the relationship was in the headlines again with the visit of Brunei’s air force chief to Singapore. Hamzah Sahat, the commander of the Royal Brunei Air Force (RBAirF) who had assumed his current position just last August amid wider defense changes in the Southeast Asian state, made his introductory visit to Singapore between January 8 to January 10. Hamzah’s trip, which was the first publicized defense engagement between the two sides in 2019, included a series of interactions. He met with several top Singapore defense officials, including Defense Minister Ng Eng Hen, Chief of Defense Force Melvyn Ong, and Chief of Air Force Mervyn Tan. Those meetings provided an opportunity for both sides to discuss bilateral ties and wider regional and global issues as well. As is often the case with such visits, Hamzah’s trip also saw him undertake other activities as well, including visits to defense facilities in Singapore. This time around, he visited RSAF’s Air Force Training Command as part of this trip. Unsurprisingly, no further details were publicly provided on the private deliberations by either side. Nonetheless, with the first publicized defense engagement between the two sides in 2019 having now occurred, further interactions will be interesting to watch to shed light about the extent of continuity and change in the defense relationship and broader ties more generally.